Some days before I went to Curaçao, I received a ‘Georgia Mansur palette’. That’s a free sample of ‘Daniel Smith extra fine watercolor’, in a range of colours chosen by Georgia Mansur, (well-known for her Plein Air workshops). It has sixteen dots of real watercolour. You only have to wet them with your brush and paint. I took it with me, to try it at Curaçao. I found a subject to paint: a ‘special tree’ in the neighbourhood. I went to sit in the tree’s own shadow. First I made a sketch in charcoal. Then I started painting. The palette is just right for trees! There are various browns and greys. With the blues and yellows and the ‘phthalo turquoise’ (which looks like peacock green) I mixed greens. This tree had my attention because of its special shape. It looked like a statue, with different human-like shapes entangled. I wanted this shape to come out by using different shades of brown. I managed to do this by mixing part of it with ‘quinacridone gold’ and others with ‘sugilite genuine’. The gold is very strong and warm, while the sugilite is a cool lilac-purple. I was surprised of the small quantity of paint I needed. When this painting was finished, the tiny dots of paint weren’t all gone. Even some of the ‘quinacridone gold’ was left. Some days later I made one more painting with the palette. And then there was still some paint left. I used it to enhance the effect of some parts of other paintings. The ‘gold’ made yellow walls ‘sparkling’, and the ‘turquoise’ added depth to the green leaves of trees. The dark colours, ‘piemontite genuine’, sodalite genuine’ and ‘bloodstone genuine’, all produced of real minerals, make lively shadows. When I returned from my trip, I mailed Georgia Mansur to tell her about my experiences with the palette. I asked her too if I could receive some more, and promised to write about it in my blog (this blog). She liked it and sent me some more palettes. I wanted to use these palettes to make ‘plein air’ watercolour paintings in my own surroundings. But the Dutch weather isn’t reliable. March and the start of April were extremely cold. I don’t like sitting outdoors in the freezing cold. 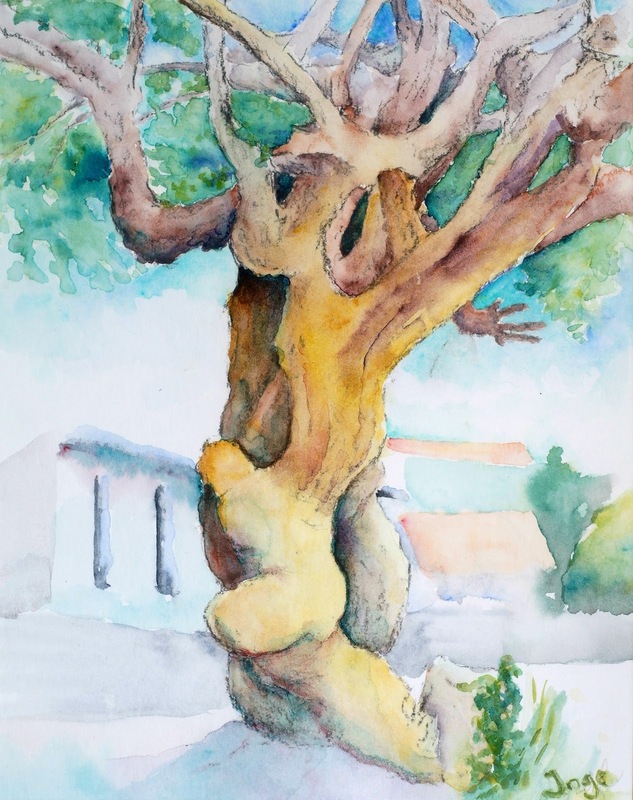 One of my new friends from Curaçao asked me to make a watercolour painting for her (with help of the photos I made there). I decided to use one of the palettes. I knew the ‘cobalt blue’ and the ‘french ultramarine’, together with the ‘quinacridone gold’ and the ‘phthalo turquoise’ were just what I needed for her balcony. And the ‘sugilite’ and other ‘genuines’ would make wonderful shadows. Even though I was sitting indoors, in the Netherlands, with only some photos of the colourful balcony, with these colours the painting got the ‘plein air look’. Now I still have parts of the palettes left. I hope spring will come soon ... and then I’ll write about it.